QUESTION: Hi Martin I have a question I hope you can find time to answer. It appears we are heading into dark times with regards to the convergence of all of these cycles. We have government hunting every penny, we have civil war heating up between the left and right, we have revolution against government, international war and decreased solar activity. It seems everything is about to go bang all at once, has there been other periods in history when all of these cycles have converged as we are beginning to witness now on a global scale? Really fascinating stuff, and thank you. ANSWER: Oh yes. Here is a chart of the real data for global cyclical trends in the energy output of the sun and CO2 levels. 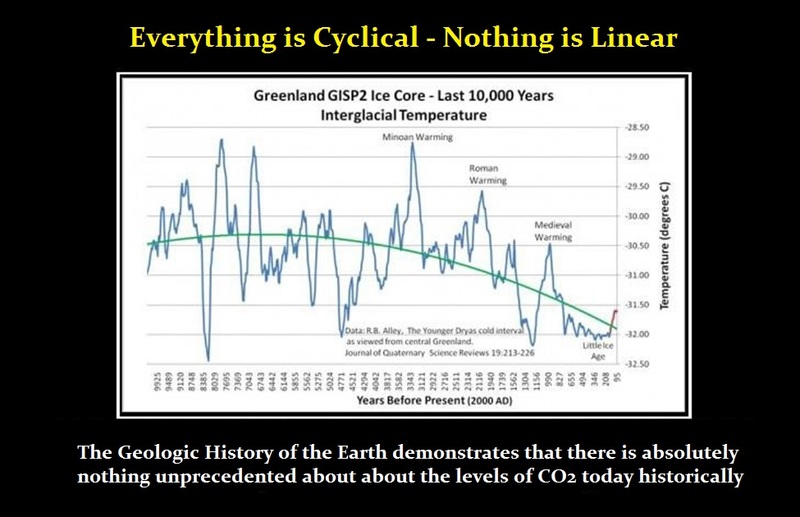 Look at this chart prior to the Minoan warming. There was a very cold period a bit longer than 8,000 years ago — the Ice Age. You see what I would call a slingshot move when the temperatures swung sharply to a record high over about 300 years, according to the ice core samples. Thereafter, we move into a bear market, oscillating trend to retest the low made 4700 years ago. Then there is the steady rise into what we call the Minoan high. Prior to the Minoan high, the temperature (climate change) was much more volatile. This is what drove the great migrations of humans around the globe if we assume they are correct and life began in Africa. This is the sharp swings that most likely resulted in frozen mammoths, lions, and woolly rhinoceros that were discovered in 1772. The warming up period into the Minoan high was really the birth of civilization/urbanization. 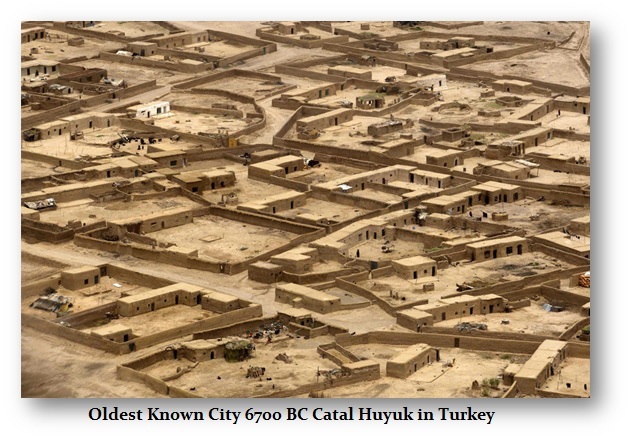 It was about 6700 BC when the earliest city appeared known by the name Catal Huyuk located in Turkey that covered about 30 acres. The buildings were of mud and brick construction, but inside there appeared plastered walls. No doubt, this was the latest modern invention that illustrates two important developments. First, this confirms the birth of an urban trade skill, and secondly, homes were found with paintings on the walls, suggesting the flourishing development of art — one of the last skills to develop within urban life reflecting good economic times. The Minoan civilization was an Aegean Bronze Age civilization that arose on the island of Crete and other Aegean islands and flourished from approximately 3650 BC to 1400 BC. Clearly, sea travel must have emerged for the people to migrate from Turkey to Crete. Civilization appeared to emerge with this warming period. You then have the catastrophic eruption of Thera (Santorini), which may have been the largest known volcanic eruption within recorded history. That ended the Minoan civilization and gave rise to the plundering society of Mycenaean Greeks who conquered the Minoans and then Troy. But as weather turned colder, Greece, mostly rocky, entered its Dark Age and was unable to produce enough food. They became the Sea Peoples who invaded Northern Africa. The climate changed again and began to warm, inspiring the rise of the Roman Empire. The warming trend allowed Julius Caesar (100-44 BC) to conquer and civilize Europe. The Roman Empire had three major climate changes known as the Early Subatlantic (900 BC–175 AD), Mid-Subatlantic (175–750 AD), and Late Subatlantic (since 750 AD). Written, archaeological evidence independently records that during the period of the Roman Empire’s maximum expansion and final crisis, the climate underwent drastic changes of cooling. During the reign of Trajan (98-117 AD), this was the peak in the territory occupied by the Roman Empire, which coincided with the Roman climatic peak in warming. The climate change resulted in a sharp trend to a colder climate, which inspired the barbarian invasions (migration) into the Roman Empire where they moved south as the north grew severely colder. Historians imply that there were rapid fluctuations during the late empire after the reign of Trajan. We do have Seneca the Younger describing in 61 AD, a year before Nero ordered him to kill himself, the high level of air pollution in Rome associated with the extensive wood burning for fuel. This confirms there has always been pollution associated with cities. The Roman Empire is considered to have peaked with the reign of Marcus Aureleus in 180 AD. That is where we draw the line for the beginning of the decline and fall of Rome. That is certainly the peak in the population of Rome itself. When the climate began to turn down, back into a strong cooling period, the fortunes of Rome also turned down. The evidence suggests that the Great Monetary collapse of Rome (around 180–290 AD), coincided with a sharp period of cooling. This seriously affected the northwestern provinces of the empire, especially in Germany and France, which clearly instigated the barbarian invasions of the south. We also have tree-rings dating (dendrochronology) from this period, which indicates there was a severe drought that began about 338 AD and persisted until 377 AD. This contributed to moving the capitol to Constantinople, which construction began about 324 AD when Constantine became the sole ruler. The climate changed much colder in the north and sent the invasion of the Huns. The migration of the Huns, north of the Black Sea, drove the Goths to flee and press into the Roman Empire. The Roman Emperor Claudius II Gothicus (268-270 AD) was given that title for his defeat of the Goths. Climate change was a major driving force that led to the fall of the Western portion of the Roman Empire with the last Roman Emperor Romulus Augustus (475-476 AD). In the Eastern Roman Empire, climate change resulted in a regional prolonged drought from about 400—540 AD. The medieval warming was when the Dark Age of Europe began to light, giving birth to the Renaissance period. We begin to see the age of empire building when Spain, Portugal, Britain, and the Dutch all went off to the travel the world. We then begin to fall back into the last mini-Ice Age. 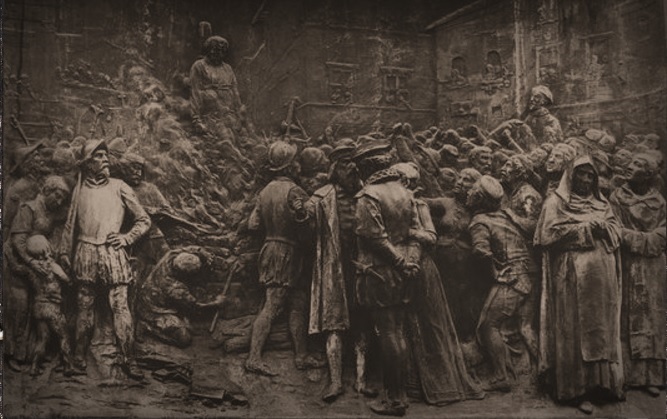 We can see that the hard times led to revolution against monarchy in America and France. 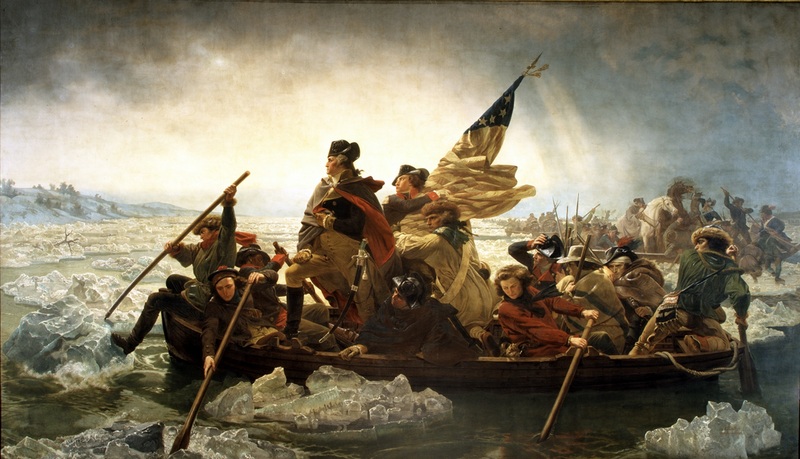 Paintings of the American Revolution illustrate how cold it really was with Washington crossing the iced Delaware River. So unfortunately, when I say we have put everything into this model, I really mean what I say. When you put together the historical data, what pops out at you is just amazing. I had to gather coins from around the world to recreate the world monetary system and then place that on the timeline as well. What jumps out at you is the correlation of civilization and the rise and fall of empires with climate change. To have these charlatans schlep this bogus theory that man has created this global warming trend prevents real research. It is outrageous that these people have the audacity to want to make disagreeing with them a criminal act. I will not shut up, for these people are blocking a real investigation into how the world functions. I really would prefer death to living in this fake world that these horrible, pretend scientists are trying to create as Karl Marx did. These same types of people burned Giordano Bruno alive at the stake for saying that the Earth revolved around the Sun. If these people could, they would do this to me in a second. I welcome Trump's pick for the EPA - THIS IS DESPERATELY NEEDED!